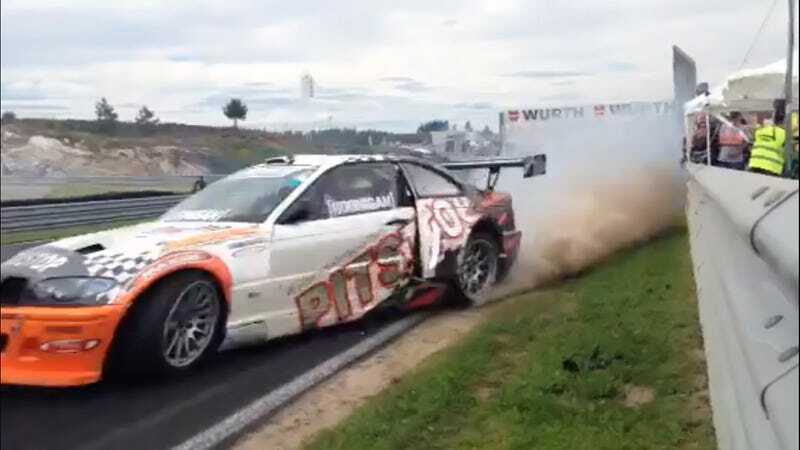 Oh look, it's our good friend Ryan Tuerck in a particularly beastly BMW drift car. And there's a cameraman leaning over the guardrail and holycrapwatchoutgetthehelloutoftheway! This is Gatebil at Rudskogen, Swedens semi-regular car show/drift fest/meet up/time attack/burnout extravaganza, and here's what Tuerck said himself about this video posted by Speedhunters on Facebook. Saw Fredric Aasbø hit this line at Gatebil and spray all the photographers and track workers with debris. I knew I had to try it. Fastest part of the Rudskogen circuit. So fast and fun. Gatebilinsanity. I don't really think that whoever was holding this camera was in serious danger. Tuerck is one of the best drifters out there, and I'd trust him to not obliterate me entering a turn.